The convergence of agile development, containerization, microservices and DevOps is transforming the notion of migrating to the cloud — it’s no longer a destination, but instead it’s a larger, multi-cloud operating model, says a leading chief technologist in a new FedScoop report. Although moving to the cloud may have started as an exercise in lowering costs, the most forward-leaning federal enterprises now take a strategic approach to cloud computing and its business and digital transformation benefits, the report concludes. Those include speed, agility and responsiveness to agency mission requirements. With this comes a fundamental shift in how agencies must think about the cloud, says Cameron Chehreh, chief technology officer at Dell EMC Federal, which is leading a push to help agencies visualize a roadmap to their next-generation enterprise. The cloud is transforming into an operating model, not just a destination, Chehreh says. “All missions and mission requirements in the government are different. In order to address leveraging cloud as an operating model, not a destination, you have to have a multi-cloud strategy,” he says. Managing a multi-cloud environment may be a new and daunting endeavor for many large and midsize government agencies, but agencies can take advantage of the transition work already underway in the private industry, he says. Chehreh cites two recent studies in the report, by IDC and RightScale, which found that more than 80 percent of enterprises have committed to multi-cloud architectures. Chehreh acknowledges agencies face complex IT environments, built on top of legacy systems and years of adaptation, making it much more complicated to deploy and manage cloud-ready apps on an enterprise scale. But he urges agencies to take a step back and look at how key applications can and must operate in a multi-cloud IT environment. The report outlines four critical questions agency leaders should be asking as they look to redeploy their applications in a multi-cloud operating environment. “It’s all about interoperability. There are going to be workloads that agencies will find are not technically or financially viable to run in a public cloud infrastructure. So, they’re going to want to run those workloads in a private, on-premise cloud, which begins to create the first aspect of a multi-cloud cloud environment,” he says. 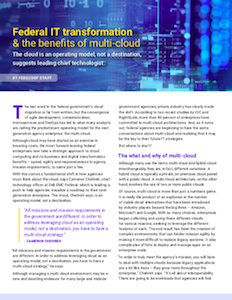 Planning for successful multi-cloud operations is not only possible but is absolutely necessary for today’s modern a government IT enterprise and for agencies to meet their mission requirements, Chehreh suggests. To accomplish that, he suggests agencies look to the principles captured in the so-called Agile Manifesto. Written in 2001 by 17 independent software developers, the Agile Manifesto laid the groundwork for a reimagining of software development that focused on producing working software incrementally and avoiding cumbersome documentation, lengthy contract negotiations and requirements processes. Behind the transition to a multi-cloud strategy, Chehreh also points to the confluence of four forces building momentum in IT: agile development, containerization, microservices and DevOps. Each offers powerful tools and approaches for transforming how agencies deliver IT services, he says. The report also highlights how federal agencies, such as FEMA, are harnessing those forces to help agencies envision their next-generation enterprise. But the process of leveraging a multi-cloud model begins with assessing each agency’s application portfolio and making critical decisions about how those applications will evolve going forward, he says. Download the full report, “Federal IT transformation and the benefits of multi-cloud,” or learn more about other federal Digital Transformation Heroes. 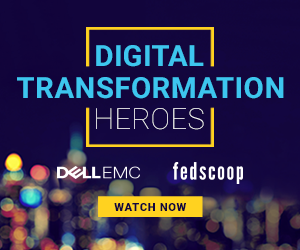 This article was produced by FedScoop for, and sponsored by, Dell EMC.